2). Plastic is pervasive, a waste of petroleum, and a drastic planetary disaster in the making. I ran across the article, "The Bottled Water Risk: ‘Tapped’ Awareness Event" from Columbia University's Earth Institute's "State of the Planet" website. The picture above was striking. 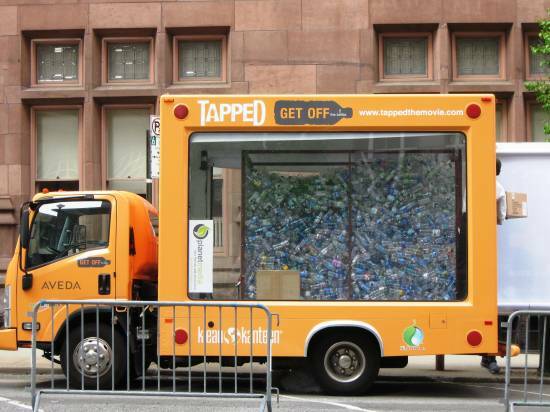 What as great way to bring about awareness of the perils of the plastic bottle... and advertise the importance of the movie "Tapped." I think this truck should be on tour in every city!! When I was grabbing some green-stats to use in my QR Code Eco-Quiz Cards I wrote about last week, I ran across the statistic that only 2 out of every 10 plastic water bottles are recycled. That's 20% folks. That means 80% of water bottles are NOT recycled, but rather trashed, & become landfill fodder. In today's age and time, I find this highly remarkable and downright distasteful. We know better. We should be doing better. There's no reason for us not to! 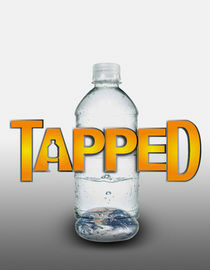 I haven't seen it yet, but "Tapped" is high on my Netflix Queue. This trailer says it all... and hopefully it makes it a "must-see" on your queue too!